Gilets jaunes : don't you find a little disturbing to hail French pigs ? Today the Yellow Vests’s slogans and behaviours are exactly the opposite. Is this a good thing ? In my humble opinion, no ! Does this come from a better analysis of the present political regime? No ! In fact, the comparison of the Gaullist regime with Nazism and Marshal Pétain dictatorship has been replaced by the comparison of the Macron-Philippe government (1) with the caricature of a decaying monarchy, forgetting that the French Revolution dethroned the nobility and replaced it by the bourgeoisie (2) ; either by a vision of the State inspired by extreme right and conspiracy theories: for those people, the State lies in the hands of the banks (and especially of one, the same that has been denounced by the anti-Semites for almost two centuries), in the hands of the IMF, “Brussels,” Finance, “Oligarchy,” etc. The Yellow Vests keep telling that they have good relations with the police, that the cops or the gendarmes support them, discreetly express their sympathy for the Yellow Vests, etc. They believe, or want to believe, that the gendarmes and the CRS (who are supposed to maintain “public order”, i.e. to impose a repressive order) exist to maintain “social links” (dixit Jean-François Bernaba, a Yellow Vests “messenger ” often invited by French televisions). The Yellow Vests think that the cops are to be pitied because their overtime hours have not yet been paid. They believe that police individual and collective violence is only triggered by the orders given by an evil Minister of the Interior or a President of the Republic who is arrogant and refuses to listen to the demands of the “people.” They think that there are only a few bad elementss inside the French repressive forces that are generally “ healthy”. In short, CRS and gendarmes are sweet lambs, nice social assistants or kind social workers impeded by the horrible Macron to perform their useful social tasks of maintaining social harmony. CRS and gendarmes do not belong to the “State” that the Yellow Vests constantly attack. The Yellow Vests ignore that the French State can count on the 78,000 “guardians of peace” (ordinary cops) ; 13,000 CRS (specialized in breaking up demonstrations and beating protesters) ; 17,000 gendarmes (linked to the army) and 188,000 soldiers divided between the navy, the air force and the army. That is 300,000 people armed to suppress the population not to distribute roses, ice creams or sweets to the protesters. To the extent that this movement, on the social networks and in the streets, is animated by individuals who claim to be “apolitical” (i.e., who have sympathies for the right and the extreme right, or for the royalists; people who share “sovereignist” and therefore xenophobic ideas), by supporters of right and left nationalist politicians, it is not surprising that these people deeply love the police and bourgeois order. Their political model is a society based on the repression of the exploited, whatever social demagogy they propagate to win additional voters or activists. Because some of the Yellow Vests are exploited like us, must we also love the policemen and their uniforms ? Must we demonstrate behind blue-white-red flags and admire the fact that “the people” sings La Marseillaise because it reminds us ... 1789 ? The froggish populism of the Yellow Vests is (paradoxically but only in appearance) in perfect harmony with the noglobal, “Indignados,” Occupy, citizenist and ecologist discourses that have been popular on the left for 20 years. These “new social movements” deny any role to the working class. They prostrate themselves in front the virtues of the “people” Just like those who claim to be “apolitical” defend right-wing ideas, those who deny the existence of social classes and class struggle support the movements in which the claims of the bosses are mingled in the greatest confusion. Executives, craftsmen, tradesmen, workers, self-employed and employees. This confusion only serves the interests of present and future bosses. There is no contradiction between the active participation of the French far right in building mini barricades or having serious confrontations with the cops. These brutes can perfectly admire the Police or the Army and at the same time fight with them in the streets, as a good occasion to train themselves, to prove their masculinity, to mount political provocations or even to prepare a coup d'état based on the fascist elements of the army and the police. Extreme right and cops, employers militia and mercenaries, (ex-)militaries and (ex-)policemen, organized crime gangs, this little world welcomes all sorts of people who would love to become small or big political « leaders », and they absolutely need to prove themselves in the field ... even if they have to hurt some “colleagues” to attain their goals. Unlike some radical leftists who like to punch the cops just for the fun of doing it but have no political project at all, these professional and “apolitical” thugs have a clear and precise goal: to rely on the Yellow Vests movement, which they have themselves initiateed on the social networks from the outset, to spread even more widely their reactionary, populist and fascist ideas. 1. 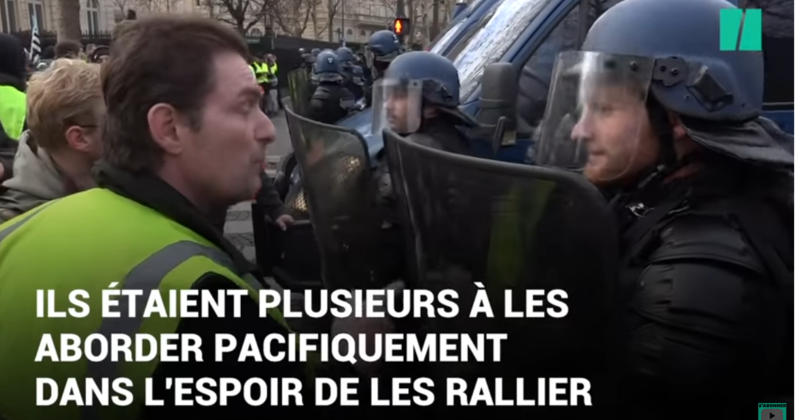 As André Dréan has rightly pointed out (https://libcom.org/blog/about-gilets-jaunes-even-oysters-08012019 ), it is significant that Prime Minister Edouard Philippe, who comes from the nuclear lobby and Areva, is spared by the Yellow jackets.